With SUV Season in full swing, now’s a great time to check out the 2018 Ford Explorer. This rugged SUV has all the capability you need to go on plenty of adventures, plus it works great for everyday driving. You also enjoy helpful technologies and designs that only enhance the fun and practicality. See all the 2018 Ford Explorer models by visiting Southern California Ford Dealers today. Get away from it all and drink in the beauty of nature with the Ford Explorer. This SUV has the power and capability to really take you places, leading to many memorable adventures. Go ahead and leave the pavement behind for a change. To keep the good times rolling, Ford provides you choice of three engines. The 3.5-liter Ti-VCT V-6 hits hard with 290 horsepower and 255 lb.-ft. of torque, plus variable control of valve timing means better performance throughout the rpm range. You get 280 horsepower and 310 lb.-ft. of torque with the 2.3-liter EcoBoost engine, which also helps conserve fuel. You can add four-wheel drive and the Class II Trailer Tow Package for even more outdoor fun. to produce a potent 365 horsepower and 350 lb.-ft. of torque. It works with intelligent four-wheel drive and the Terrain Management System, plus hill descent control to ensure your adventures go smoothly. Standard with this engine, the Class II Trailer Tow Package allows the SUV to pull up to 5,000 pounds. Each engine works with a six-speed SelectShift automatic transmission for smooth gear transitions. Sport and Platinum models also feature paddle shifters mounted to the steering wheel, so making manual gear changes is quick and easy. Feel more secure, stay entertained, and keep in the information loop with the Ford Explorer. It can be outfitted with some impressive equipment you’ll find useful day after day. An optional front 180-degree camera allows you to see clearly in front of the SUV. It’s a great feature when you’re emerging from a blind alley or similar situation where visibility normally would be minimal. The camera has a washer to keep the lens clear, plus a split-view option. With the Ford Safe & Smart Package, you add even more safety systems to the Ford Explorer. Bundled in this package are auto high-beam headlights, rain-sensing wipers, a lane-keeping system, blind spot monitoring, rear cross-traffic alert, and adaptive cruise control. Through the available Sync 3 infotainment system you get quick responses to commands. It even allows you to speak naturally to get directions, play music, or do other tasks without taking your hands off the steering wheel. Designed to accommodate your lifestyle, the Ford Explorer has equipment that will keep you happy and productive. It works for adventuring in the wilderness or navigating your daily life in civilization. Three-rows of seating means everyone can come along for the journey. Space is excellent on each row, plus the rear cargo area can accommodate your gear. Everyone is surrounded by quality materials, plus plenty of cupholders and storage options to keep everything organized. 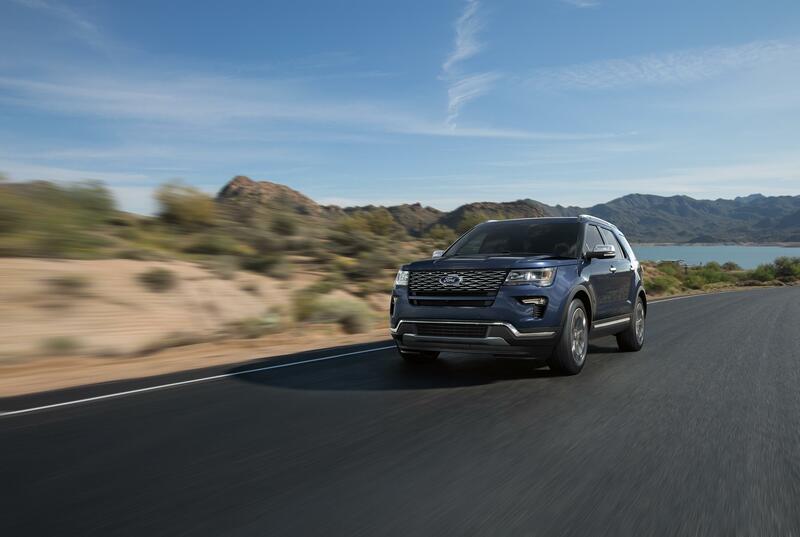 Discover how great it is to drive the 2018 Ford Explorer today by visiting Southern California Ford Dealers.